The Lumistar LS-28-DRSM Series Multi-Mode Multi-Band Receiver/Combiner/TM Processing Unit is designed using ruggedized packaging to survive severe airborne conditions. The LS-28-DRSM is available in several configurations: 1) Airborne receiver only (RF to bits), 2) Airborne bit synchronizer only, 3) RF to TM Processing and Display (RF to bits to UDP decom to LAN Client Displays). 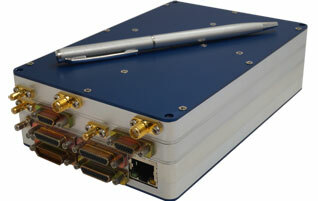 Models with receivers are available in any band form 200 MHz to 7 GHz with S, lower L and C bands as standards. Other RF bands are available, please consult the factory for details. This unit can be mated with other Lumistar products to provide a complete air-to-ground re-transmission system. Please see the LS-28-DRSM User Manual for more information, or contact us at sales@lumistar.net.